“The beauty of Jesus is inexhaustible. Like the Vision of God in Heaven, it is ever diversified, yet always the same, always cherished as an old and familiar joy, yet ever surprising and refreshing the spirit as being, in truth, perpetually new. He is beautiful always, beautiful everywhere, in the disfigurement of the Passion as well as in the splendor of the Resurrection, amid the horrors of the Scourging, as well amid the indescribable attractions of Bethlehem. But above all things our Blessed Lord is beautiful in His Mother. If we love Him we must love her. We must know her in order to know Him. As there is no true devotion to His Sacred Humanity, which is not mindful of His Divinity, so there is no adequate love of the Son, which dis-joins Him from His Mother…. Comment: The unerring wisdom of the saints and the church is that devotion to Mary is a sure and safe means of persevering in our love of Jesus. The first beats of our Lord’s Sacred Heart took place in her womb, and her own heart was pierced by a sword when she stood faithfully by Him at the foot of the Cross, when he bequeathed her to us, saying, “Behold, Your Mother.” If Jesus has given us such a tremendous gift – His very mother, the Mother of God – than we should have every confidence in approaching her tender, maternal heart with love and true devotion. The spiritual journey wearies and tires us. Discouragements seem to lurk around every corner. Our great need is for perseverance. Devotion to Mary is a tried and tested means of perseverance, according to the experience of the saints. 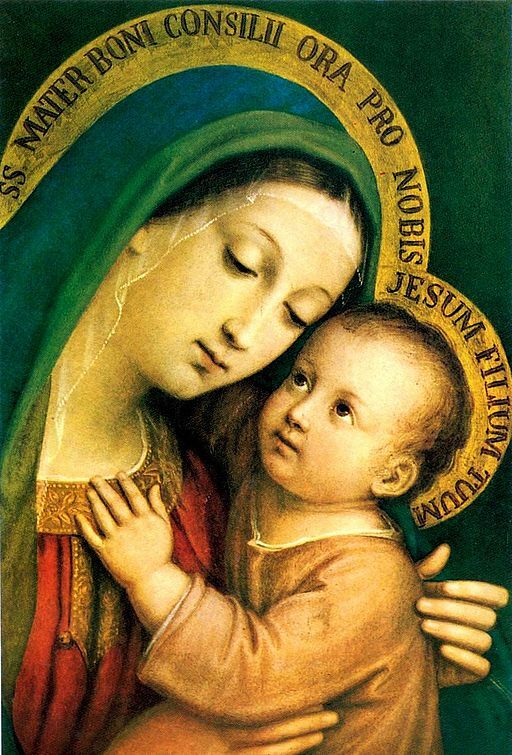 Image: Our Lady of Good Counsel by Pasqualle Sarullo (Public Domain, U.S.A.).